Let me just put it out here right up front that the weekend did NOT include a certain long-distance race and it was NOT my fault. We got an email Saturday morning that my 50K (and UltraIronHubs’ marathon) was canceled, due to unforeseen circumstances. What a huge disappointment!! Obviously, on a scale of 1 – Actual Tragedy, this was still in the low single digits, but it left us both in a weird limbo of having tapered for a non-event. We both ended up with extremely low mileage for the week, and mixed feelings about whether or not we should try to pick up another race on short notice. As it turned out, the RD emailed again within a few hours, rescheduling the race for this coming Sunday, the 8th. Not ideal from an extra-long taper point of view, but we are going to make it work. On a much more exciting note, my weekend DID include my kiddos’ first track meet of the season! They were both pretty nervous, but ended up having a really good day. 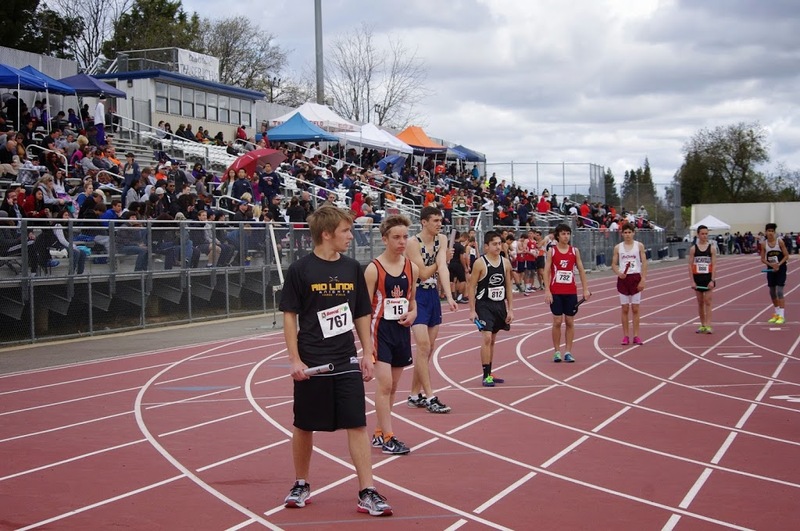 This was Little Boy’s first high school track meet and I was so anxious to see how he would do. 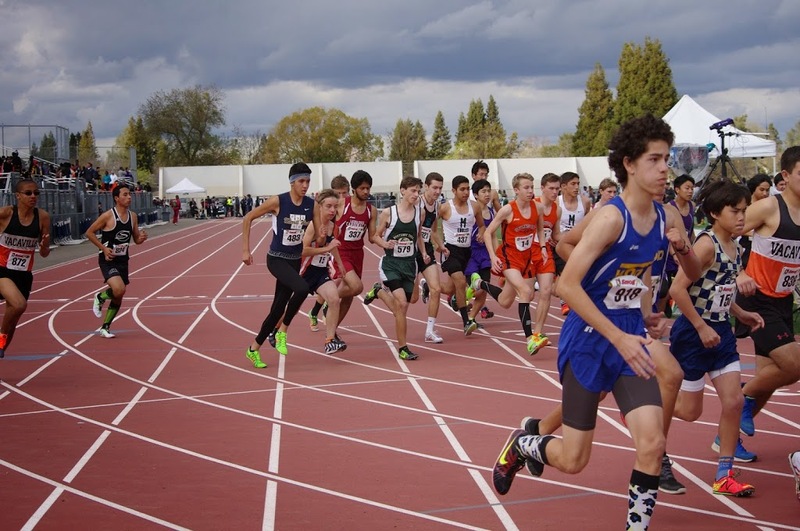 Both boys competed in the Distance Medley Relay (DMR), which is a team of four kids and each kid runs a different distance – 400, 800, 1200, and 1600 meters. Little Boy ran the 1200 (three times around the track) for the Frosh/Soph team and Big Boy ran the 1200 for the Varsity team. 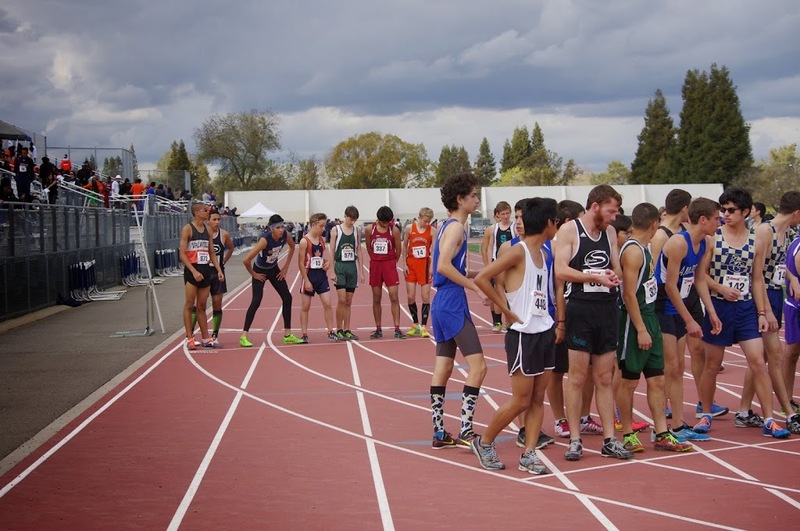 Lining up for the start of the DMR. My kid is wearing bib #15, second from left. The distances aren’t run in order, so this is sort of a confusing event for spectators. 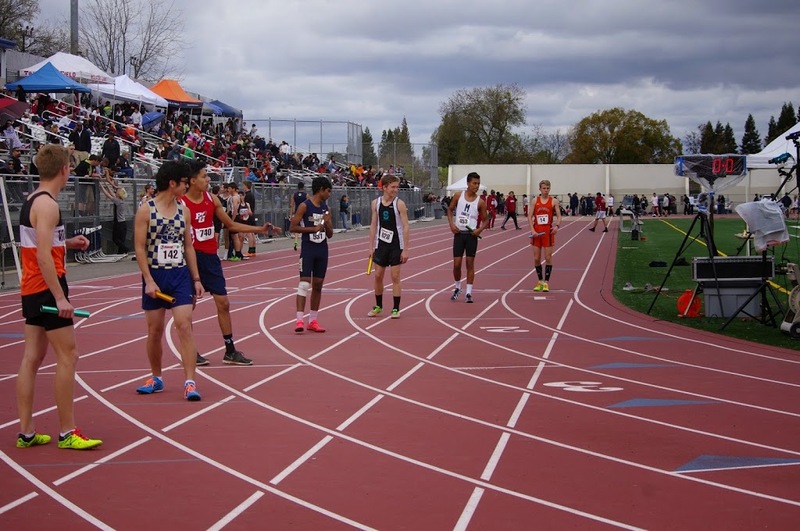 The 1200 meter runner goes first, then the 400, then 800, then 1600. 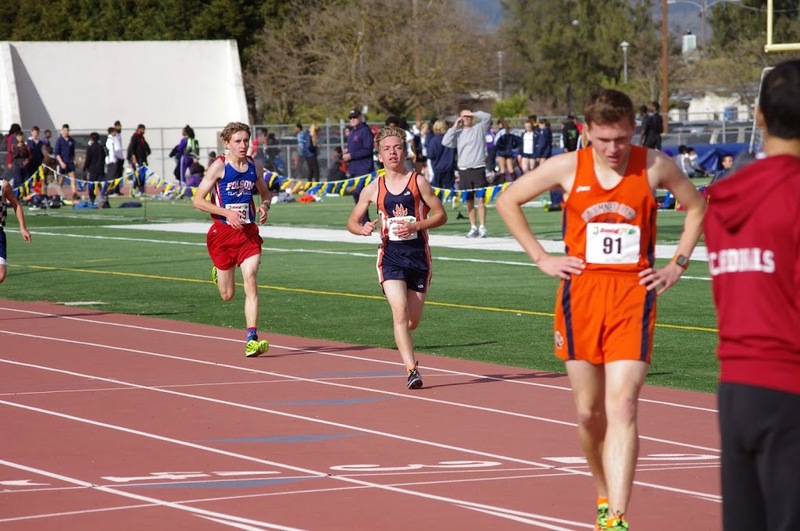 Little Boy did what Little Boy does – he went out WAY too hard, then ran positive splits. Lol! His team ended up in fifth place out of seven teams. Big Boy is on the far right, #14. Oddly, Big Boy ran almost the exact same split as Little Boy – going out too hard, then petering out. His team also ended up in fifth place. I love this photo, though, because he looks like he is flying. I was a little concerned that their mediocre performance at the DMR would lead to a bobble at their other event, but I shouldn’t have worried. 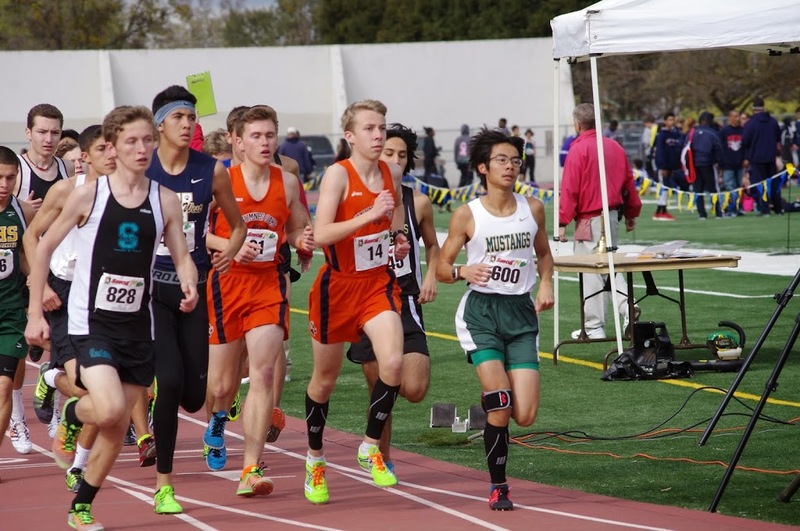 Both boys also competed at the 3200 meters (2 miles), going head-to-head in the Varsity event (there wasn’t a Frosh/Soph 3200, so Little Boy stepped up to the big leagues). 35 boys at the starting line! And only one other freshman in the lot, who Little Boy managed to beat. Not that I trolled the results for that or anything. The first 50 meters make me so nervous! All those feet! I was holding my breath, waiting for somebody to get tripped, but both boys got a really good start. Big Boy went out with the lead pack and Little Boy (whose one and only goal for this race was to keep up with his brother) was right on his back pocket. You can’t really see Little Boy in this photo, but he’s right behind his teammates. I love this shot of Big Boy – he totally had the Eye of the Tiger going on. 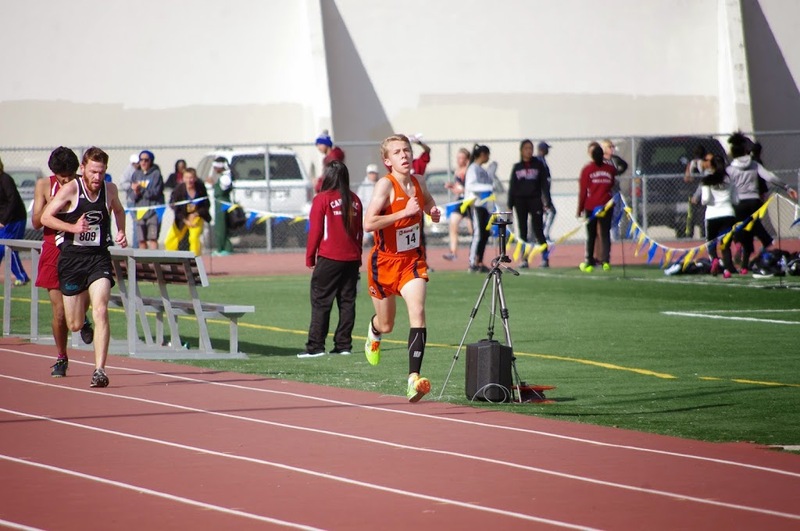 This was one of the best 3200s I’ve ever seen him run. His splits were right on the money, nice and steady. And every time they came around, Little Boy was still hanging with them – I couldn’t believe it! The final sprint, giving it everything he had! 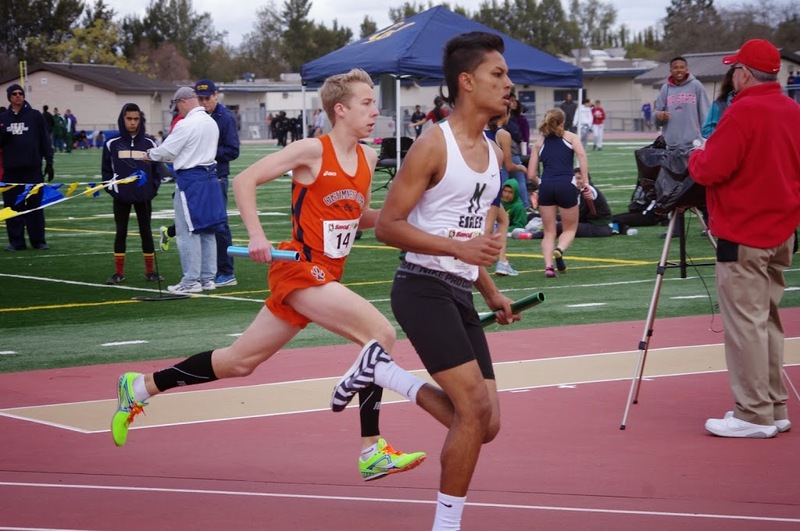 Big Boy ran a brilliant 3200, coming in 4th place overall and earning a 3-second PR over his best time last year – 10:38!! In this photo, you can see Little Boy in the background, coming around the curve. Sprinting to the finish! Little Boy stunned me with his tenacity at this race – running a 1-mile PR on his way to a 2-mile PR over his best cross country time (this was his first time running a 3200 meter on a track)!! 10:54, 12th place overall!! It does a mama’s heart good when her kids run well. We came home and celebrated with showers, drinking lots of water, and foam rollering. And I even stayed up a little late because I didn’t have a race the next day. I know, we get wild around here on a Saturday night! Sunday morning, I headed out for a long run of indeterminate length. I really didn’t know what to do with this extra week of training – I didn’t want to go too long and I didn’t want to go too short. So I ran twelve miles and just called it a recovery week. C’est la vie. Sunrise in my glasses and spring blossoms at my back. It was a really spectacular morning. This month is looking like March Madness, for sure. This week, the boys have a distance meet (meaning only distance events, no sprints or field events) on Friday afternoon. Then I have a 7K race on Saturday morning (part of the NorCal Tour de Fit series), AND a 50K on Sunday. Oh my! We have a track meet every weekend this month and I have one more race on the 29th. This is likely going to be a big mileage month for me and my car. Ha! How was your weekend? Your month? Have you ever had a big race get canceled or postponed?? 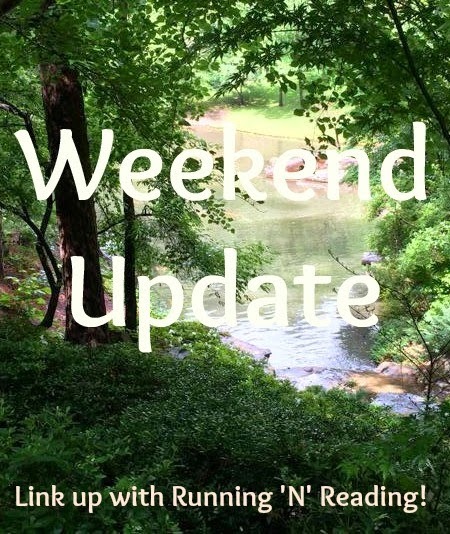 I’m linking up with my girl Tara over at Running ‘n Reading for the Weekend Update!! I would be such a proud Mama!! Yeah, what DO you do with an extra week you weren’t counting on? Well at least the race was just postponed and not cancelled altogether. PS – I don’t transition well from work week to weekend and then back. I prefer routine. I Pahla, your account of the AR50 scares the hell out of me. I know I am not trained as good as I should be, struggled through the last 50k I ran last week and now I am starring at 50 miles! Can’t say I am looking forward to the race, but looking forward to pushing my body to the limits. So exciting to see your boys do well! 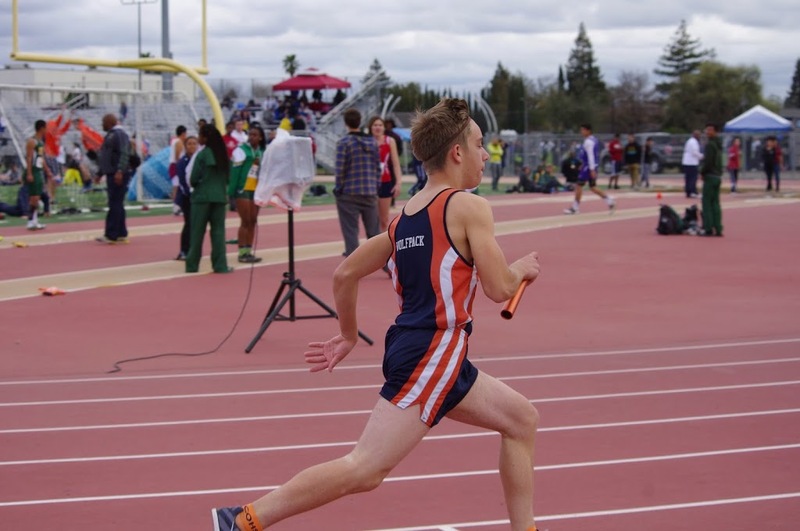 My older boys both ran track, but that was before I was a runner, so I really didn’t understand much of what was going on regarding distances and paces, etc. My youngest will be in middle school next year and plans to do track and XC, so I’m much better prepared to be a runner mom this time around! My weekend fun was riding bikes in the snow. Couldn’t be much different from your sunny, t-shirt running picture. 🙂 Hopefully spring is FINALLY on the way! I saw your snow riding pictures. OMG, I got cold just looking at them!! I am so impressed that you ride in that weather! Don’t be scared!!! This is a wonderful race and you are going to be awesome! 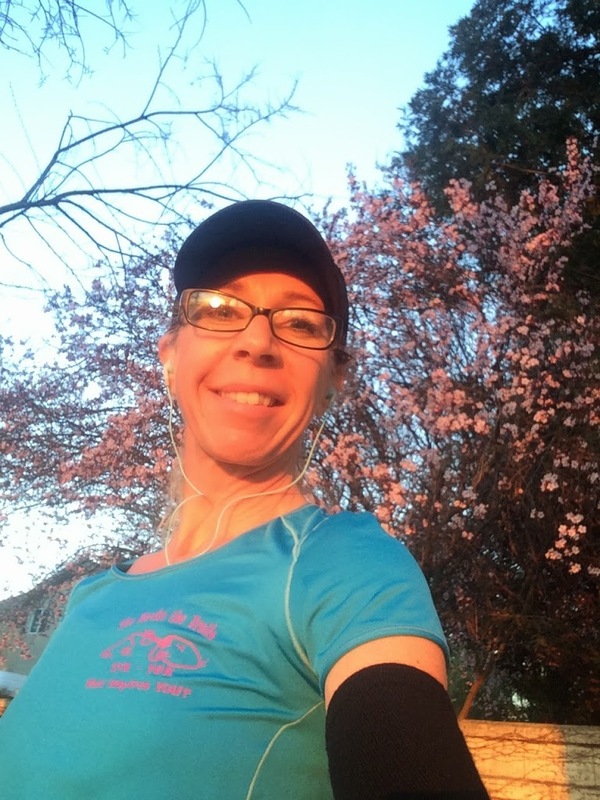 Which 50K did you do last week?? I would always rather be undertrained for a race and go in with legs a little fresh, rather than tired. I wonder what the circumstances for the postponing of your race could be? I’ve never had a race postponed. Although the 07 Chi Marathon SHOULD have been. 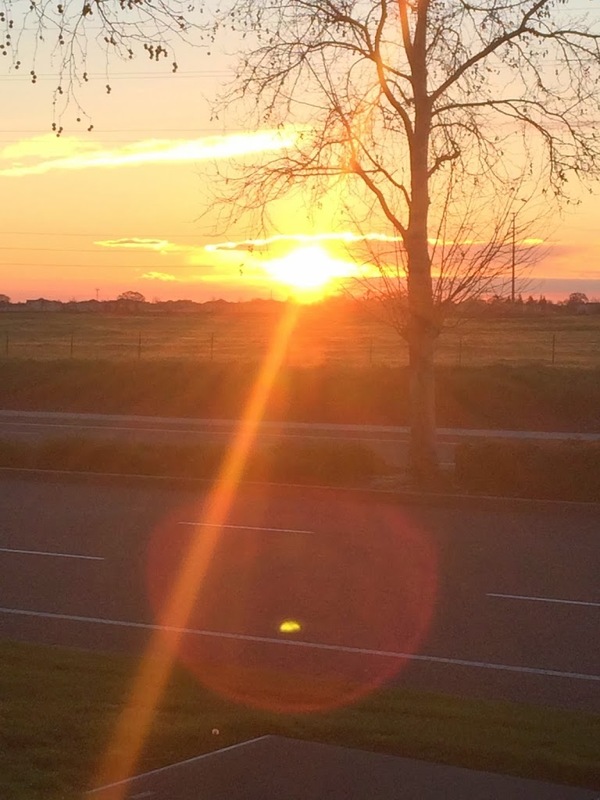 Will having a 50k the next day change the way you race the day before? It breaks my heart when I see kids without parents at the meets. I know there could be a million reasons, but mostly I think it’s sad. I cheer for everyone on the team for all of the events. And the kids that I know on the other teams. And really, anybody. LOL. I’ll talk more about the postponement when I do the race recap next week, I don’t want to burn any bridges on the internet before I need to. O_o And you *know* it’s killing me to take the shorter race slower! I’m definitely not doing the 50K for a PR, and the 7K is actually an automatic PR no matter how slow I go, but… I’ll probably give it what I’ve got. 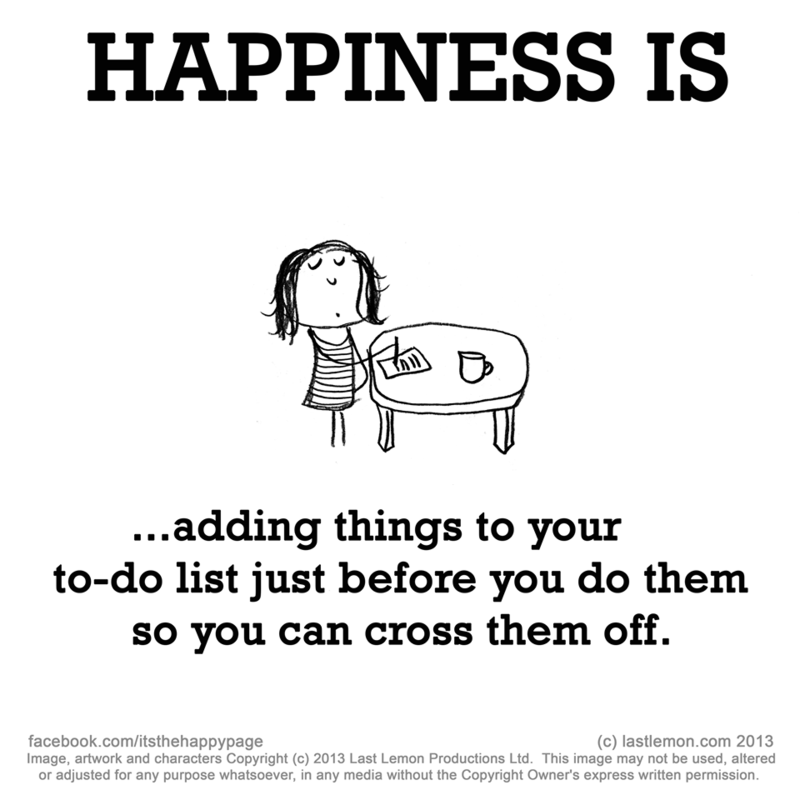 It’s what I do! That would be frustrating to have a big event canceled! Glad you still got in a 12-miler and the kids’ races sound so exciting.